Former assistant commissioner John O'Mahoney. A RETIRED SENIOR garda has told the Disclosures Tribunal that he purposefully did not seek to engage with Maurice McCabe when he was investigating claims by the sergeant that fixed charge penalty notices were being cancelled. Former assistant commissioner John O’Mahoney told the Tribunal today that he strongly suspected it was Maurice McCabe who was one of the whistleblowers behind the penalty points issue but felt “precluded” from talking to him. He said it was because that both McCabe and John Wilson had reported the matter confidentially and, despite believing that both men were the ones whistleblowing, he didn’t seek to speak to them during his investigation. The penalty points scandal that emerged in 2013 and 2014 became a major headache for An Garda Síochána and is tied in with the central claims being made in the Tribunal. 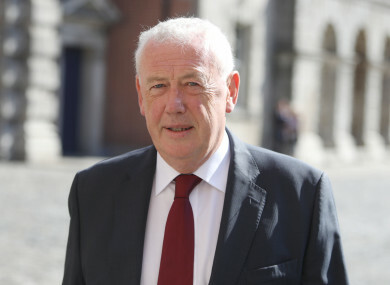 Former press officer Superintendent Dave Taylor has said that because McCabe was such a source of frustration for raising these issues, then-commissioner Martin Callinan ordered Taylor to conduct a smear campaign against the whistleblower in the media. The issue of McCabe’s cooperation with this internal garda review into penalty points has also been a point of huge contention. Solicitor Gerald Kean has told the Tribunal that Callinan told him that McCabe “had not cooperated in any shape or form” with O’Mahoney’s inquiry. The solicitor spoke by phone with the former commissioner several times before a panel appearance on the RTÉ Marian Finucane Sunday Show, on 26 January 2014. Kean said he felt Callinan was “beyond reproach” and was alarmed when McCabe subsequently rang RTÉ to complain about him saying on the show that the whistleblower had not cooperated with the inquiry. McCabe has always said he was “never directed by the Commissioner to cooperate with the O’Mahony investigation as alleged”. Former Minister for Justice Alan Shatter, meanwhile, has told the Tribunal that he had a departmental official write to McCabe in late 2012/early 2013 suggesting that McCabe engage with an internal garda review into the penalty points matter, but McCabe opted to retain his anonymity. Shatter said that – if he was O’Mahoney – he would have tried to engage with McCabe at an earlier stage, or sought permission from the commissioner to do so. Callinan, meanwhile, told the Tribunal that believed McCabe “didn’t engage with the process”. Former assistant commissioner O’Mahoney said today that he felt that there were “strong protections” around those who’d come forward with the penalty points claims, and he “proceeded by the rules under the confidential reporting of malpractice and corruption”. O’Mahoney said that, when suspicions grew that McCabe was making the allegations, there wasn’t a sense of “here we go again – that troublemaker making even more trouble for the garda” at Garda HQ . He said that the matter was treated with the utmost seriousness and that was reflected by the resources he was given to conduct his investigations. The Tribunal heard that O’Mahoney spoke to McCabe only after he sent his report on the penalty points issue to Justice Minister Shatter. On the attitude of Martin Callinan to whistleblowers, O’Mahoney said that he didn’t think that the then-commissioner was “frustrated” and never spoke in a “derogatory manner” about McCabe. To me, it would appear to be out character. Some of the words [allegedly] used, I don’t think are the type of words he would use. I think he remained very resilient despite the pressure. Also giving evidence today was Superintendent John Ferris, who works with the garda communications team. He said that questions asked by journalists personally related to issues around Maurice McCabe or Nóirín O’Sullivan would usually be sent upwards by the press office to the director of communications Andrew McLindon or the commissioner’s office. The Tribunal also heard that an external communications consultant had drafted a set of “nasty questions” that Nóirín O’Sullivan should prepare to face when she was doorstepped. It was also put to Ferris that answers to a number of press queries sent in to the gardaí were “unsatisfactory”. Later in proceedings crime journalist Michael O’Toole told the Tribunal that he was not the recipient of smears or negative briefings about McCabe. O’Toole, the assistant editor and crime correspondent at the Irish Daily Star, said his relationship with Taylor was “proper and professional”. “Nobody in An Garda Síochána smeared or negatively briefed Sergeant McCabe to me,” O’Toole said. He said he was approached by “a very experienced journalist with significant access to the political world” around 2011 or 2012, who asked him about rumours about McCabe. O’Toole checked the rumour with a trusted contact and established that the Director of Public Prosecutions had determined there was no evidence a crime was disclosed. “Once I heard that, the matter was dead for me,” O’Toole said. The contact spoke highly of McCabe, calling him “Maurice”, O’Toole said. He added that the contact was not someone in garda headquarters or the garda press office. “I was always of the view that the garda press office is his master’s voice. They don’t work for journalists, they work for the commissioner,” O’Toole said. He said that if a senior garda officer smeared McCabe, this would stand out in his memory as a newsworthy event. He said it was preposterous that someone would brief him at a crime scene, as the scenes were “chaotic” and he would be busy working on the story before a deadline. Noel Whelan BL, on behalf on the garda commissioner, said it was “relatively easy” for someone in O’Toole’s line of work to debunk the rumours about McCabe. “I had someone with knowledge of the situation, who I trusted implicitly,” O’Toole said. He said journalists were not popular, crime journalists even less so, and he was “vexed by the suggestion crime reporters including myself were used in this smear”. “That story did rankle with me, and it has rankled ever since,” O’Toole added. Email “Retired garda says it would've been 'out of character' for Callinan to say such nasty things about McCabe”. Feedback on “Retired garda says it would've been 'out of character' for Callinan to say such nasty things about McCabe”.